DYNAMIX Defender Line-interactive Uninterruptible Power Supply (UPS) can instantly switches your computer to emergency battery backup power and allows you to work through mains power outages without data loss or downtime. It continuously conditions the power coming into your computer and providing power supply for virtually zero interruption. 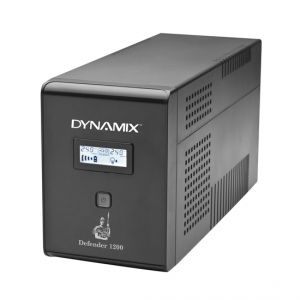 The Defender range uses Automatic Voltage Regulation (AVR) to minimize the effects of fluctuations in input voltage protecting your valuable equipment from power line disturbances. The stylish LCD display, user replaceable batteries and six Australia/NZ sockets makes the Defender the complete package at this level. The warranty on these UPS is 12 months for the batteries, and 2 years for the rest of the parts.